The next meeting of the MCCM Board will be June 24, 2014 at 6:00pm at the Jasper First Baptist Church. Saturday, May 10 the Marion County Rotaract Club responded to a call for help from Marion County Community Ministry. The four man team, along with an advisor, cleaned the cemetery and cataloged and mapped the grave sites located there. According to Timothy McNabb, Rotaract President, the four members of Rotaract that came was president Timothy McNabb, Vice-President Riley Hargis, Blaze Moats, Zach Pratt, and adviser Wes Jarrett. Melissa Brown, Publisher, Marion County Newspapers, Inc. The above article was authored by Melissa Brown and appeared originally in the South Pittsburg Hustler. Picture submitted by Rotaract. Thank you to our Good Neighbors from The United Way of Marion County. In May the Good Neighbors Program received from The United Way a grant of $5,000.00. This grant will enable MCCM to help about 70 of our friends in Marion County avoid disconnection of vital utilities services. 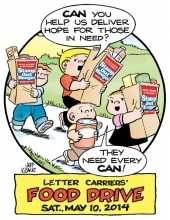 On May 14 the USPS Letter Carriers around the country, held their annual “Help Stamp Out Hunger” food drive. USPS Letter Carriers in Jasper, Sequatchie, South Pittsburg, and Whitwell picked up food as they made their “appointed rounds”. After all the food was collected and weighed the MCCM food bank had received over 2500 pounds of food. Thank you USPS Letter Carriers. We know it is a lot of extra work and time for you to do this, but your neighbors who are hungry are especially grateful. If you left food by your mailbox thank you. * Inscription on the James Farley Post Office in New York City. The “Drive 4UR Community” event on May 23, sponsored by Moss Motors and Ford Motor Company was a success. 125 of our friends and neighbors stopped by to take a test drive resulting in a $2500 donation to Marion County Community Ministries. Many thanks to Scott Collier who organized the event for MCCM, and to Shawn Henson and Amanda Frame of Moss Motors who brought 11 new Ford Vehicles, a pop-up canopy, and sign-up sheets etc. Many thanks also to our MCCM Volunteers, Sam Anderson,Sandy Webb, Derrald Beck, Glenn Boren, George Jackson, Rhonda Mines, and Sandy Webb who handled registration of the drivers, brought water and snacks, helped with setup and tear down, and did whatever else was needed.